In perhaps one of the most insensitive marketing ploys since Air Force One buzzed the Statue of Liberty, Burlington Coat Factory is planting "lost" bags all over the city. Whatever marketing genius came up with this idea has obviously never ridden the subway, or taken an airplane from JFK. He's possibly never even been to New York. 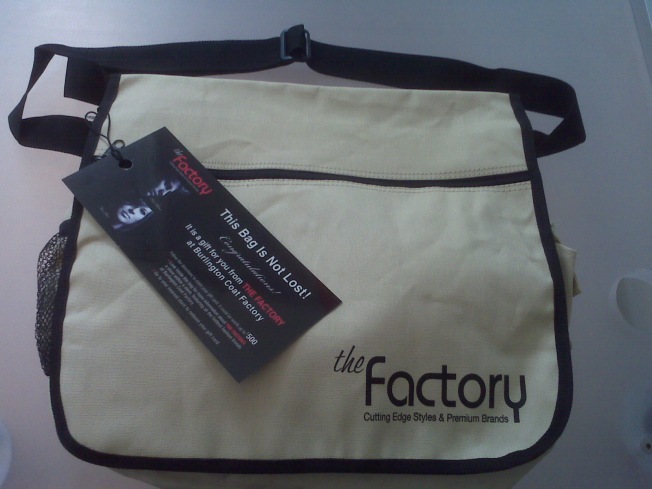 The "Factory" messenger bags have a $500 gift certificate in them and are intended to announce the opening of a new store. Burlington hopes that there is such high media awareness of the effort that people will be on alert and the city will erupt in some sort of Golden Ticket-like frenzied hunt for the stashed bags. It's nearly inconceivable to them, apparently, that someone would mistake one of their marketing packs for a garden-variety unattended bag. Why is not exactly clear. Perhaps they are idiots. Sure the New York Post compares this stunt to the Cartoon Network's viral marketing ploy in Boston that sent that city into a panic, but by comparison, the similarity to a terrorist plot seemed unintended in Beantown and, while however boneheaded, unintentional. By contrast, in New York we have signs that read "If you see something, say something." A Burlington spokeswoman stresses that the company is "in contact with the police" to inform them of the promotion and received the go-ahead, also a marketing street team will be nearby at all times. The bags will also be placed in private establishments, not public locations. The Coat Factory people also note that in the Cartoon Network's Boston campaign that went awry nobody was warned, and nobody was attending the weird, wired boxes that were placed in random public locations. They left out that the boxes did not actually resemble posters warning people about terrorist activities in the same way their "promotion" does. They were also very specific in taking pains to point out that the bags won't actually be left unattended: they'll just be pretend "unattended" -- left out in the open with no one standing next to them, giving them the appearance of being unattended.